Mexico is allowing a horde of over one thousand illegal (mostly) Central American migrants–many of whom are infants and children–to march through the country on their way to the United States where they will either seek asylum or try to illegally cross the border. The invading migrants are organized into groups and sub-groups like an army. 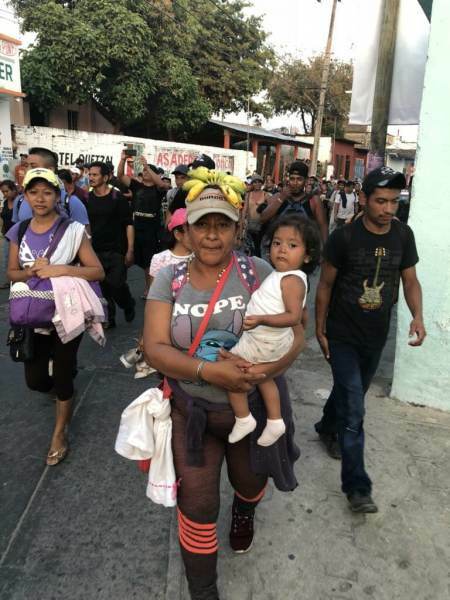 A mother, her daughter and granddaughter from El Salvador–three generations of illegal aliens on the march through Mexico to the U.S. Photo by Adolpho Flores via Twitter. Video of Mexican authorities allowing the migrant army to cross into Mexico from Guatemala bound for the United States. Buzzfeed has embedded a reporter, Adolfo Flores, with the illegal migrant army which is being led by the group, Pueblos Sin Fronteras. The migrants receive guidance and training from Pueblos Sin Fronteras but are reportedly responsible for their own expenses, food and water. …For five days now hundreds of Central Americans — children, women, and men, most of them from Honduras — have boldly crossed immigration checkpoints, military bases, and police in a desperate, sometimes chaotic march toward the United States. Despite their being in Mexico without authorization, no one has made any effort to stop them. End excerpt, please read the entire article at Buzzfeed. The article reports migrants are given training jumping on ‘The Beast’ train used by illegals traversing Mexico who risk life and limb riding on the roofs of the train’s cars. Flores has also posted updates on the looming invasion via Twitter. The majority of the migrants are from Honduras. Organizers of the caravan believe they make up about 70% of the group. They’re followed by migrants from El Salvador, Guatemala, and Nicaragua. Trump administration Homeland Security Secretary Kirstjen Nielsen was in Mexico this week concluding agreements with the Mexican government. Apparently nothing was done to pressure Mexico to stop and deport the migrants before their invasion of the United States.